Golden Giant amaranth is a nutritious grain - high in protein and gluten-free. It's also an attractive ornamental. 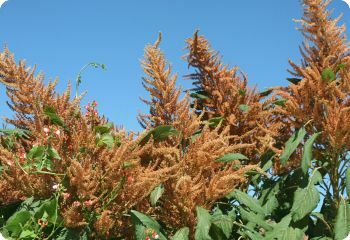 The large plumes of golden-brown flowers bloom from mid summer to fall, and the ripening seeds attract flocks of birds. Amaranth 'Golden Giant' is a heavy producer of delicious, white seeds. This is probably the best amaranth for grain production for home gardeners. Also known as Amaranthus hypochondriacus. 98-110 days to maturity. Sow amaranth seeds outdoors close to the last frost date. Or start indoors 4 weeks early. Barely cover the seeds with soil. Thin to 15" apart. Full sun.